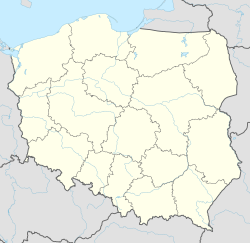 Sejny [ˈsɛi̯nɨ] (Lithuanian: Seinai) is a town in north-eastern Poland and the capital of Sejny County, in Podlaskie Voivodeship, close to the northern border with Lithuania and Belarus. It is located in the eastern part of the Suwałki Lake Area (Polish: Pojezierze Suwalskie), on the Marycha river (Seina in Lithuanian for which the town was named), being a tributary of the Czarna Hańcza. As of 1999 it had almost 6,500 permanent inhabitants, with a strong seasonal increase during the tourist season. In the early Middle Ages the area comprising modern Sejny was inhabited by the Yotvingian, one of the Baltic tribes that had arrived in the area in the first millennium. After internal struggles of the 13th century, the area was subject to expansion from both Masovia and Lithuania. As a result of the armed incursions of the Teutonic Order, the area was almost entirely depopulated. Only a few descendants of the Yotvingians survived. In the 14th century the area was the scene of constant struggles between the Lithuanians and the Teutons. The first written record of the area where the town now lies dates to 1385, noting an armed raid of the German knights from Merkinė to Giżycko. After the Teutonic-Lithuanian border was established in 1422, people began to return to the forests in the area. New roads were paved. The road leading from Berżniki through what is now Sejny to Merkinė, became a notable trade route. In 1510 Michał Pac became the governor of the area, founding the settlement of Berżniki. This started a period of rapid development of the former Yotvingian lands. According to a legend, the town of Sejny was started by three of the old knights of King Władysław Jagiełło, who after the Battle of Grunwald granted them a land parcel in what is now Sejny. The three were very old and named the settlement Seni, which is a Lithuanian word for Old Men. The name was purportedly given to the city of Sejny. But, no archaeological findings or documents support this legend. The name is Yotvingian in origin. The linguist Jerzy Nalepa has proposed that the nearby river name Sejna (now Marycha) and the city name are Yotvingian. This conclusion is based on two features, (1) the presence of "s" (vs. Lith. "š") and (2) retention of the diphthong "ei". Cognates include Pol. siano and Lith. šienas, both meaning "hay". On December 22, 1522, Sigismund I of Poland ordered the voivod of Podlaskie Janusz Kostewicz to grant half of a square mile of land at the shores of the river Sejna (now called Marycha) to hetman Iwan Wiśniowiecki. On May 21 of the following year Kostewicz described the parcel in a letter to the king and soon afterwards Wiśniowiecki became the owner of the area. A new wooden manor was built in the place where the Sejna river reached Sejny lake and soon settlement started. Wiśniowiecki, a mighty magnate from Volhynia, never came there personally and instead appointed his governor to rule the hamlet. In 1593 the town was sold by his great granddaughter Anna, wife of voivod of Vitebsk Mikołaj Sapieha, to a local noble Jerzy Grodziński for sixty times the amount of 10.000 grosz in silver. Until 1602 he transferred the unnamed village (sometimes referred to as Sejna) into a town called Juriewo, after its founder. However, the name did not stick and instead it was named Sejny. The town's market was located on a small hill overlooking the right bank of the river, near the original wooden manor. It was located right on the earlier trade route. South of the town a new road leading to Grodno was created and the new settlement received significant income from trading. The founder of the town financed a Catholic St George's church and established a new parochy. Jerzy Grodziński died without heirs. On May 16, 1602, he had bequeathed all of his properties to the Dominican monastery in Vilnius. He died on January 12, 1603 and on June 4, 1603 king Sigismund III Vasa accepted the testament. In 1610 the monks started the construction of a large monastery there. The construction of the monastery was finished in 1619 and by 1632 a new church was built nearby, devoted to Holy Mary, Saint George and Saint Hyacinth. The town developed slowly, mostly due to low traffic on the old trade routes to Grodno. In the 17th century another church was built, consecrated to the Holy Spirit. A printing press was started and most probably a hospital. The monastery was being constantly expanded, becoming one of the most notable examples of a fortified monastery in Central Europe. War with Sweden, known as The Deluge in Polish history, halted the city's growth. In 1656, after a major battle took place in the area, the town was captured by the Swedes, looted and burnt to the ground. The monastery survived and, after the war ended, the monks returned to the town and started its reconstruction. On November 8, 1670, king Michał Korybut Wiśniowiecki granted the town the privilege of organizing a market and fair once a week. This helped the monks to repopulate the town with new settlers, mostly from over-populated Masovia. In the early 18th century the Great Northern War put an end to the prosperity, as the town was pillaged by several armies in a row. The soldiers also carried two consecutive plagues to the town. At the same time the area was being populated, and numerous settlements were founded not far from Sejny. In 1715 the Camedulian monks founded a village and a monastery, which developed into what is now the town of Suwałki. Other towns founded in that period were Puńsk, Augustów, Jeleniewo and Krasnopol. With increased prosperity in the town, the Dominicans started the reconstruction of Sejny, leading to construction of notable examples of baroque architecture. The church received a new façade, in 1770 a new town hall was built, and in 1778 a new marketplace and a new Wooden synagogue were opened. The Neo-baroque Sejny Synagogue was built in the 1860s. Since the deportation and murder of the Jews in the Holocaust during World War II, this structure is now used as a cultural center. Under the Partitions of Poland, in 1794 Sejny became part of the Kingdom of Prussia and was confiscated by the Prussian authorities in 1797. Initially neglected, in 1807 the town became part of the Duchy of Warsaw and a major administrative centre. After the defeat of Napoleon Bonaparte in 1815, the town was transferred to the Kingdom of Poland, retaining its status as a seat of a powiat. In 1818 the bishopric was moved to Sejny from Wigry and Sejny Priest Seminary was established in 1826. The town continued to prosper, despite a major fire that had struck the city earlier that year. The population also grew rapidly. Prosperity declined in the later part of the 19th century. After the November Uprising and the January Uprising, in which the city's inhabitants took part in the struggles against Imperial Russia, the town was deprived of its privileges. It was neglected by Russia. The lack of railway development by the Russian Empire prevented the town from developing industry. Sejny continued as a small provincial town and a local centre of trade and commerce. During the Great War, in 1915 the town was captured by Germany. Initially their forces made it part of the Ober Ost military administration, but Germany planned this area to be one of the puppet states in Central Europe in accordance with their Mitteleuropa plan. Following Germany's defeat in the war, the German garrisons started to withdraw from the area. On May 8, 1919 the administration over the town was passed to the renewed nation of Lithuania. This led to tensions between Poland and Lithuania, as both sides claimed the area. Under pressure from the Conference of Ambassadors (later to become the League of Nations), Poland initially backed down on the issue, but, on August 22, 1919, on the day German troops withdrew from the area, Polish Military Organization organized military action against the Lithuanian rule in what became known as the Sejny Uprising (or "Seinai Revolt"). Several times Sejny changed hands. During these battles, both sides used repressive measures. On August 28, the so-called uprising ended with a Polish success, and the town became a part of Poland. After Poles acquired the town and its surroundings, the Lithuanian population of the region was subject to various repressions. Depending on the source, these repressions are described as having included evictions; banning the use of Lithuanian language in public; closures of Lithuanian organizations, schools and press; and confiscation of property. In his book examining the period, historian Piotr Łossowski suggested that both sides exaggerated repressions they suffered during the uprising and its aftermath in order to elicit internal and external support. Sejny town at the time had approximately 2500 inhabitants. Only a year later, the town was captured by the Bolshevist Russia in the course of the Polish-Bolshevik War. To ensure the right of passage through Lithuanian territory, on July 12, 1920 the Russian authorities signed the Soviet-Lithuanian Treaty of 1920, in which it granted the Lithuanians the rights to the area. On July 19 the Lithuanians attacked the Polish defenders and recaptured the town. The Lithuanian authorities were once again established in the area. After the Battle of Warsaw the Bolshevik forces were defeated and the Polish Army again entered the area under Lithuanian control. As the Paris Peace Conference established the Polish-Lithuanian border on an ethnic basis, roughly correspondent to the status quo ante bellum, the Lithuanian forces were forced to withdraw from the town and on August 31, 1920 the town was yet again attached to Poland. However, the Lithuanian authorities continued to claim the area and on September 2 a Lithuanian offensive started the so-called Polish-Lithuanian War. As the town was located only some 2 kilometres (1 mile) from the Lithuanian border, it was easily captured by Lithuanian forces. However, the assault was repelled with heavy losses on Lithuanian side and the Polish Army recaptured the town on September 9. The following day the last of the Lithuanian units retreated to the other side of the border and on October 7 a cease fire agreement was signed, leaving Sejny on the Polish side of the border. During the interbellum, the town continued to be claimed by Lithuania and it was not until the 1938 Polish ultimatum that Lithuania finally agreed for a delimitation of the border. In 1925 the bishopric and the powiat status were removed, but the town remained a notable centre of not only trade and commerce, but also wood and furniture production, gaining profits from the nearby forests. During the Polish Defensive War of 1939 the town was first captured by the Soviet Union on September 24, 1939. Sejny was severely pillaged and then on October 13, 1939 transferred to Nazi Germany. It remained occupied by the Germans for the rest of World War II, which resulted in almost complete destruction of the local Jewish community in the gas chambers of the German extermination camps. On August 31, 1944 the town was again captured by the Red Army and soon afterwards it was delivered to the new Soviet-controlled communist authorities of Poland. After the war the local population, largely depleted during the war, started to recuperate. A notable influx of Poles resettled from the Polish areas annexed by the Soviet Union allowed for fast reconstruction of the town. In 1956, after the administrative reform of that year, Sejny once again became a seat of a powiat. Although it was cancelled in 1975, the new administrative division of Poland passed in 1999 reinstituted it. Depopulation may ultimately again threaten the present local and regional administrative organisation. Currently Sejny is a notable centre of trade, production and tourism, with thousands of tourists visiting the town every year. A dairy and a cheese factory are located in the town, as well as numerous hotels. Sejny is also a notable centre of cultural life of the Lithuanian minority in Poland. It is the main seat of the Lithuanian Society of Poland and the Aušra bi-weekly. Lithuanians constituted 7.9% (474) of the city's inhabitants in 2002 and 20.2% (4,271) of the population in the Sejny County (powiat) in 2011. Due to that, there is a Lithuanian consulate there, as well as a Lithuanian schooling complex (kindergarten, elementary school, gymnasium). Owing to a lost dispute about payment for the town's sewage treatment works, the town is financially crippled by debt. Mayor Arkadiusz Nowalski is fighting to rescue the town, which lacks sufficient collateral for necessary investment or to seek European development funding. Although mayor, with his 2014 shock win against the incumbent, he does not have majority support of the council. ^ a b c Poles Attacked By Lithuanians. Walter Duranty, New York Times, September 6, 1920. Accessed on October 26, 2007. ^ Lesčius, Vytautas (2004). Lietuvos kariuomenė nepriklausomybės kovose 1918–1920 (in Lithuanian). Vilnius: Vilnius University, Generolo Jono Žemaičio Lietuvos karo akademija. p. 278. ISBN 9955-423-23-4. ^ Lesčius, Vytautas (2003). Gintautas Surgailis; Algirdas Ažubalis; Grzegorz Błaszczyk; Pranas Jankauskas; Eriks Jekabsons; Waldemar Rezmer; et al. (eds.). Karo archyvas XVIII, chapter Lietuvos ir Lenkijos karinis konfliktas del Seinu krasto 1919 metais (PDF) (in Lithuanian). Vilnius: Generolo Jono Žemaičio Lietuvos karo akademija. pp. 188–189. ISSN 1392-6489. ^ "Deklaracje narodowościowe w gminach w 2002 roku". old.stat.gov.pl. Archived from the original on July 1, 2014. Retrieved June 3, 2018. ^ "Mniejszości narodowe i etniczne oraz społeczność posługująca się językiem kaszubskim wg powiatów w 2011 r. (2011 Census data)". mniejszosci.narodowe.mswia.gov.pl (in Polish). Ministry of Interior and Administration. Retrieved June 3, 2018. Wikivoyage has a travel guide for Sejny. This page was last edited on 1 March 2019, at 17:04 (UTC).